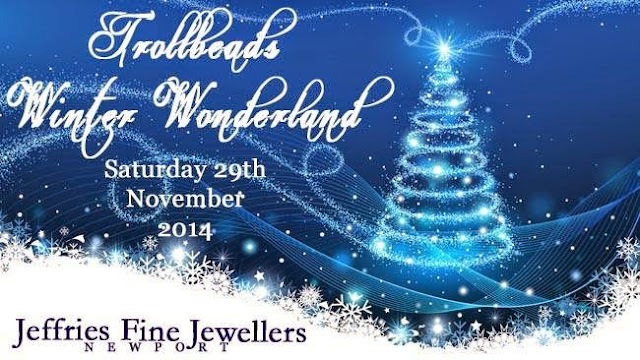 Lucky Trollbead Fans could be heading to South Wales in less than 2 weeks for Jeffries Winter Wonderland Event held at their store in Newport, South Wales on Saturday 29th November. If you're thinking of going the shop is within walking distance from the train station, which is on the main train line so there are fairly decent connections if you don't mind travelling. For those who do make the trip there will be prize draws, festive fun, a free white jewellery box for any purchase over £150 (as long as stocks last - get there early to secure), promotions, museum beads and a large selection of unique and production beads plus the chance of some free gifts AND there will be fizz and nibbles!! Sadly I won't be able to go. It's not my boiler this time that's stopping me, but my day job, as I'll be doing a lot of travelling myself over the next few weeks and unfortunately none of my trips are taking me in the right direction! If you can't attend this lovely event (and live in the UK), there still might be a treat in store for you! Jeffries are hoping to raise lots of money for the local children's charity Sparkle by holding a raffle with the prize being... the Ultimate Collector's Case - Schmuckvitrine! If you win you need to either pick this beauty up from the shop, or they will ship it to a UK address, but sadly they cannot ship internationally due to the size and weight. Charity Raffle to win a Trollbeads Ultimate Collector's Case!! 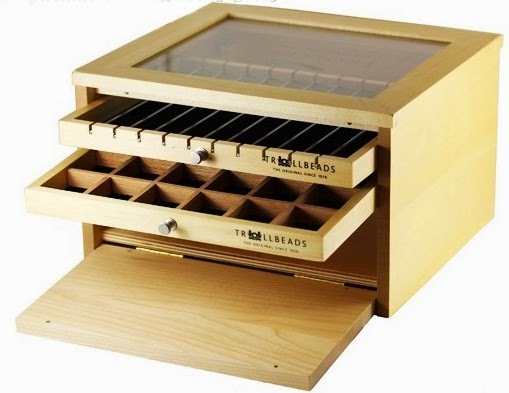 I'm told this case is no longer being made, and it is literally the last one to leave Trollbeads UK HQ! Unfortunately it was slightly damaged whilst in transit to Jeffries, I'm told it's only minor damage on one side but obviously they couldn't swap it for an undamaged one as there aren't any more left to swap it with!! If you would like to make a donation to Sparkle regardless of where you live, there is also a button on the Charity Event page for that too, there's no minimum (or maximum) donation, so if you've a spare £1, it all goes to a good cause! I can't go to the event but I've already bought my own ticket for the draw! buying a raffle ticket for the Schmuckvitrine? Or maybe all 3?! Great write up - I am going, although I missed the WTD event as I was on my hols! But I have since visited a couple of times, and it is a great shop with beautiful displays. Liz is brilliant - it is lovely being served by a retailer who is also a collector - it makes such a difference. She completely "gets it". I would have loved to have come and met everyone, but sadly I am doing so much traveling this month another trip at the end of this month was out of the question. I do hope to pop in though next time I'm down that way. I loved looking at all the photos from the World Trollbeads Day Event, it's clear that Liz and team put on a fab event last time and I'm sure this one will be too. Can't wait to see the photos!